White catfish range from California to Florida, but despite being widespread and abundant in many waters, these fish are largely ignored by anglers. That’s not the case in southern New England, however. In the waters of Massachusetts, New Hampshire, Rhode Island and Connecticut, white cats often are the best thing going. Channel catfish inhabit this region, too, but in most areas, white cats are more abundant and catchable. Bullheads also swim in local waters, but they don’t reach sizes that endear them to hard-core catfishing fanatics. There are no flatheads or blues within hundreds of miles. That leaves white cats as the whiskerfish of choice for many anglers. 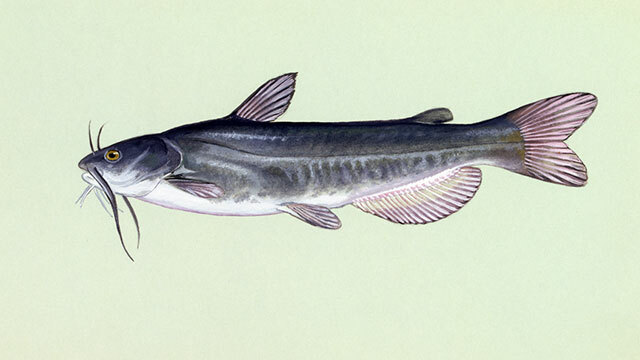 Before introductions of other species, white catfish were the largest of the native catfishes found in rivers draining into the Atlantic, from New York’s Hudson River southward through Florida. Whites also are native to tributaries of the Gulf of Mexico in Alabama and Mississippi. Their ability to adapt and reproduce in a variety of water conditions makes them appealing to fishery managers, and they have been transplanted to ponds, lakes and rivers from Oregon and Nevada to Ohio and Rhode Island. Northeast anglers are especially fond of white cats because they thrive in the brackish water of coastal rivers where other cats are absent. They sometimes live in half-strength seawater, right at the mouth of major rivers. Catching them isn’t always easy, however. For consistent success, one must possess a thorough knowledge of tidewater rivers and fishing tactics that work best. Water conditions in tidewater rivers change constantly because of the moon’s gravitational pull on the Earth. The water level fluctuates several feet each day, the river’s flow changes direction every 6-1/2 hours, and current velocity varies enormously depending on moon phase, distance from the river’s mouth and amount of runoff. Savvy tidewater anglers pay close attention to tide tables, which appear daily in local newspapers, to plan their catfishing excursions. These show when high and low tides will occur in different spots on tidal rivers. During a midsummer period of high flow and a full moon, a tidewater river has an upstream current during an incoming tide that’s nearly as strong as the downstream current during an outgoing tide. With the same moon phase in early spring, however, the river will seem almost calm on an incoming tide. When the tide goes out, the current becomes much swifter, and fishing is more difficult. Your fishing success will improve if you study such variations and learn when to expect certain conditions. Above the first dam or the fall line, a river is not influenced by tides. Roger Aziz Jr. of Methuen, Massachusetts, has fished for catfish in the tidewater rivers of his home state since boyhood. He remembers a time years ago when he could catch scores of 4- to 7-pound white cats in the Merrimack River, a large tidewater stream flowing through parts of eastern New Hampshire and northeastern Massachusetts. He also remembers the dramatic decline of white cat numbers in the mid-1980s. “At one time industrial factories lined both banks of the Merrimack,” Aziz says. “The river was dirty, polluted, but there were lots of big white cats, and I was catching six or seven in the 5- to 7-pound range every time I went fishing. The river is cleaner now, and white cats have made a comeback. Aziz ranks among the country’s top white cat anglers and has the credentials to prove it. He’s caught several line-class world records, and the techniques he uses to catch the big ones from the Merrimack can work for you, too. Aziz targets rocky stretches of river, the same areas frequented by striped bass and smallmouths. In upstream reaches of the 20-mile pool, he finds most whites in deeper holes. When fishing closer to the river’s mouth, he targets white cats holding around bridge abutments. The baits Aziz uses are 1-inch chunks of cut shad or herring, and often, strips of bacon. The fish-finder rig is another Aziz favorite. This consists of a bass-casting sinker on the line above a barrel swivel. A short leader (up to 14-pound-test line) with a Kahle hook on the end and small Styrofoam ball in the middle is tied to the swivel. “The sinker holds the rig near bottom, and the ball floats your bait up a few inches where catfish can find it,” he says. The only problem with these rigs, Aziz says, is their propensity for attracting striped bass and smallmouths in summer. Small downriggers provide a means for catching white cats holding extremely deep in brackish water. “We use light downriggers like those used on smaller lakes,” he notes. “Your line is connected to the ball, which is dropped to the bottom in deep holes with current. For Aziz and other cat fanatics in the Northeast, white cats are the essence of day-to-day fishing.